Wearing Invisalign is in no way as restrictive as traditional braces? Many adults opt for this system not only because it is discreet, but also because there is no need to change your diet to avoid foods that could damage braces. 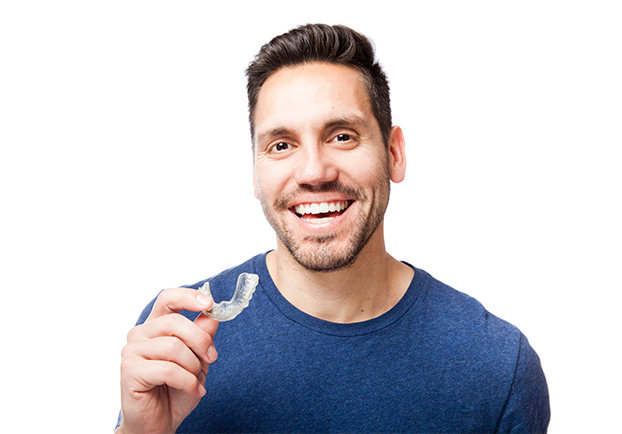 This is because the Invisalign system is free of braces and brackets, instead opting for a removable tray that can be taken out prior to meals. Also, Invisalign fits well into busy Tracy adult schedules, as there is no need to attend frequent visits for wire tightening. Most patients simply change to a new aligner tray every couple of weeks. Your cleaning and consultation will consist of a visible examination of the teeth and gums. If you haven’t been to the dentist in a while, you may also require x-rays for a more comprehensive view of your teeth. You’ll also consult with your Tracy dentist about any oral health problems you may have been having or questions that you may have. The cleaning will follow, during which a dental hygienist will use special instruments to remove hardened plaque from your teeth. Finally, your teeth will be polished before your dentist discusses any treatment recommendations he or she may have for you. Based on your budget and needs, we will be able to guide you in the right direction so that you are one step closer to obtaining the smile of your dreams. If you have any questions regarding orthodontics or if you want to schedule an evaluation or appointment, then please call our office at 510-744-9744.